With the approach of cold weather, some birds have left the area, others will soon do so, and you might observe still others just passing through. But there will be enough year-round birds to keep your birding interest. Here are a few things for you to consider. Birds need water year-round, so keep your birdbath full, clean, and unfrozen. Heated birdbaths are available for birders wishing to go that route. Fall and winter is a good time to put out the suet, a high-energy food source for birds. The easiest way to add suet to your other bird-feeding regimen is by utilizing prepackaged suet “squares” which can easily be inserted into suet cage feeders. You’ll find suet and the feeders at most stores which sell bird-feeding items. Another type of birdfeed, which you may already be using, is sunflower seeds. These can be used in ground feeders, window feeders, pole feeders…you name it. They an even be strewn upon the ground. 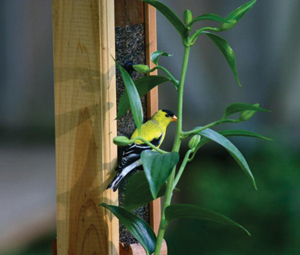 Popular with a wide variety of birds, sunflowers seeds should attract quite a few visitors to your yard. Including squirrels. If you feed birds, you inevitably feed squirrels. 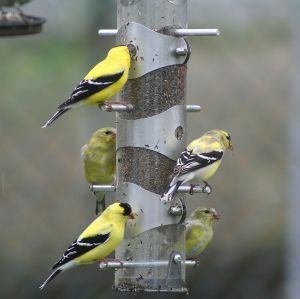 There are some squirrel-proof feeders available in birding departments and stores, as well as poles with baffles. Another ploy is give the squirrels their own feeding station with an ear of corn ready for them to eat. Nevertheless, you will discover that the squirrel is singular in its resolve to eat your sunflower seeds, incredibly athletic in its pursuit, and one of the great problem-solvers of all time in this regard. As long as you purchase reinforced tube feeders, so they don’t actually chew through the plastic or wood, and so they can’t eat your whole supply at one sitting, you can enjoy their antics at the cost of some extra sunflower seeds. A word about bird books: They are wonderful reference tools for the birder, whether new or experienced. 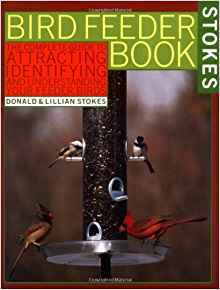 One suggestion is The Bird Feeder Book by Donald and Lillian Stokes, published by Little, Brown and Co.
Well-written, clearly laid out, and uncluttered, it is an easy-to-use and very useful “how to” guide. Your bookstore, library, or computer should help you pick out the best book for you.